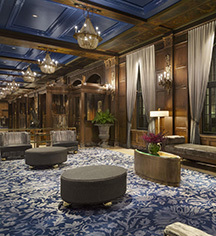 Rich in heritage, Fairmont Le Château Frontenac is an urban resort nestled in the heart of Old Québec that seduces with its historic charm, distinctive elegance, world-class hospitality, and magic touch. 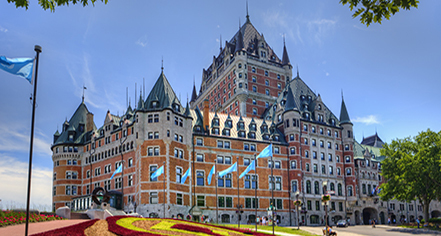 Located on the historical site of the personal residences of the English and French governors, Fairmont Le Château Frontenac stands proudly on Cap Diamant, overlooking the majestic St. Lawrence River. Designated a United Nations World Heritage Site, this stately luxury hotel stands above historic Old Québec. Over the years, Fairmont Le Château Frontenac’s luxurious furnishings, prestigious amenities, and impeccable service have attracted numerous esteemed guests. In 1939, King George VI and Queen Elizabeth were among the many personalities who graced Le Château with their presence. During the Québec Conferences of World War II, Fairmont Le Château Frontenac became the headquarters, involving U.S. President Franklin D. Roosevelt, British Prime Minister Winston Churchill, and Canadian Prime Minister William Lyon Mackenzie King. Additionally, 17 of the hotel’s most prestigious suites have officially been named in honor of famous guests who have stayed at the hotel since its opening in 1893. Brightly lit, Fairmont Le Château Frontenac is the heart and pride of the capital city. It is a mythical place where people love to meet and enjoy the hospitality that is truly worthy of a world-class hotel, and an integral and active part of Old Québec's charm. Recipient of numerous prestigious awards and accolades, it has been one of the most recognized hotels in the world ever since it’s opening. An experience at Fairmont Le Château Frontenac will guarantee a memorable and inspiring stay in one of the most beautiful, and walkable, cities in the world. Fairmont Le Château Frontenac was awarded Best Historic Hotels Worldwide hotel in the Americas for the 2017 Historic Hotels Awards of Excellence. Fairmont Le Château Frontenac, a member of Historic Hotels Worldwide since 2012, dates back to 1893. Fairmont Le Château Frontenac owes its name to a flamboyant French governor called Louis de Buade, Count of Frontenac, who guided the destiny of New France from 1672 to 1698. ATM: Only if on-site. Located in hotel lobby. Parking: Valet parking: $36 CAD per day (In/our privileges). Over-sized vehicle parking: Off site. Payment: All forms of payment are accepted. Payment is required at time of booking. Visa, MasterCard, Amex, Diners Club, JCB, and Discover are accepted. Pet Policy: Service animals allowed: Yes. (Fee exempt). Pets allowed: Yes. Dogs are welcome. Fee: $50 CAD per night. Amenities: Bowl, Mat, Blankets, and Extra. Please note only certain floors are pet friendly. Dog Ambassador: Daphnie. Rollaways: Available upon request; surcharge $30 CAD. Shuttle Service: Ski shuttle may be scheduled through the resort's concierge. Rates apply. Smoking Policy: 100% non-smoking property. Transportation: Taxi, Car Rental, Limo, may be arranged through the concierge; rates apply. Rich in heritage, Fairmont Le Château Frontenac is an urban resort nestled in the heart of Old Québec that seduces with its historic charm, distinctive elegance, world-class hospitality, and magic touch. Learn more about the History of Fairmont Le Château Frontenac .